Home » Golf Accessories and Gifts » Sabona 274 Lady Greek Key Duet Magnetic - New! Sabona 274 Lady Greek Key Duet Magnetic - New! Sabona 274 Lady Greek Key Duet Magnetic - New! ONE brand-new genuine Sabona magnetic bracelet. Sabona is a top quality, brand name manufacturer of magnetic products since 1959. A classy combination of 18K gold plating and brushed stainless steel, featuring the popular Greek Key design. Every link contains a 1200 gauss magnet. Sabona chooses Samarium Cobalt magnets for long term durability and rust resistant qualities. Sabona also incorporates the best quality clasp in magnetic bracelets! The clasp is designed to fasten securely to prevent inadvertent opening and the loss of the bracelet. Sabona Magnetic Bracelets are linked together using permanent pins. The bracelets are designed to stay intact, therefore removal of links is not recommended. Great styling Magnetic function Free attractive gift case included Ideal gift for the golfer - many have claimed benefits from wearing magnetics during their round What SIZE Do I Need? Measure your wrist size -- a flexible sewing tape measure works great for this! Your wrist size will be very close to the size of the bracelet you need. Be sure to consider how loose or snug you want your bracelet to be. Bracelet sizes are Small (6.5"), Medium (7.0") and Large (7.5").. It is recommended to order about 1/2" larger than your actual wrist size for a comfortable fit. Size Bracelet Measurement S 6.5" M 7.0" L 7.5" About MAGNETIC THERAPY THEORY Magnets have been used in different cultures over the years by those who believe magnets worn on the body promote good health. One theory is that magnet therapy may be beneficial by affecting the circulation of the blood in the body. Increased circulation is beneficial because the body gets more of the nutrients from the blood. Magnetic products should not be worn next to a watch, because it may drain the battery. Do not use magnet products during pregnancy, or if you have an electrical implant such as a pacemaker. Consult with your doctor if you have any questions and continue with regular medical care. Shipped out in three(3) business days after payment is received. Import duties, taxes and charges are not included in the item price or shipping charges. These charges are the buyer's responsibility. Please check with your country's customs office to determine what these additional costs will be prior freight (shipping) company or when you pick the item up – do not confuse them for additional shipping charges. We do not mark merchandise as "gifts" - US and International government regulations prohibit such behavior. Your item will be shipped with USPS 1st Class International service. We use this method to keep the shipping cost down for our customers. Unfortunately, package tracking is not available with this service. Shipping internationally with tracking is more costly and not usually a good option for most customers. If you wish to have package tracking, the item MUST be shipped with USPS Express Mail International service. Please contact us if you have any questions about package tracking. Payment is expected within 7 days of purchase. Please contact us for instructions if needed. Sabona Limited Warranty Sabona Copper and Magnetic Bracelets are manufactured to be high quality products. In the event there is a manufacturing defect that goes unnoticed during quality control procedures, Sabona guarantees its products against these defects for a period of six months. 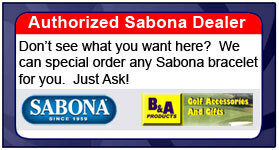 Please see the enclosed warranty card in the product box, or call Sabona Customer Service at 800-497-4199. Don't like it? No problem! This item can be returned for exchange or money back. If you are not satisfied, please email us immediately to get an RMA number! Item MUST be returned within 14 days of delivery date. Purchase price will be refunded. Shipping costs are non-refundable. Item MUST be in it's original state and packaging (in original package). Ship back your item only after your receive an RMA number from us. Buyer is responsible for return shipping charges. Refund will be given only after item is received back in unused NEW condition. After shipping, your feedback is the way we receive confirmation that you received your item and are satisfied. Please contact us to resolve any issues before giving us negative feedback! We always provide feedback to you after receiving your feedback. Our reputation is extremely important and we always aim to provide fast, reliable problem-free service. See our recent feedback below: Fast shipping! We take a great deal of pride in shipping to you as fast as possible. Items are usually shipped out either the same day or next day of receipt of your payment. Please give us a chance to serve you! Feel Free to E-mail Questions to: Golf Accessories and Gifts Customer Service Copyright 2007 B A Products, LLC. All rights reserved.